School is back in session! And the books I like to take out for my kids (okay, for me, too) usually involve letters, numbers, and anything having to do with a school setting… in a fun context, of course. 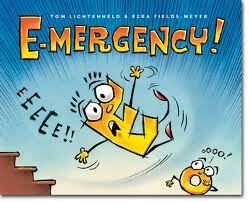 One of our favorite picks these days is E-mergency by Tom Lichtenheld and Ezra Fields-Meyer. This witty and entertaining book is full of laughs and puns. Though most of the jokes go right over my kindergartener’s head, he still enjoys the reading. And my 10-year-old understands almost of all it, making it entertaining for all ages, including adults. The younger one chuckles at the comedic illustrations and reading “EMT, IV, ER, CPR, A-OK” letters that have their own meaning. The older one is drawn to the twist of phrases, words, and letters (the letter “Z” is always sleepy, the letter “P” goes pee). So when “E” has an accident, “No one can use E, including US… Y US?” The “O” then replaces “E,” but it just won’t do – for instance, “Ice Cream” becomes “Ico Croam.” Even more than the chaos on signs and in speech, the disuse of “E” proves to be sad for all. Amidst the silliness, the underlying story that should not be ignored is that each member of a group is valuable. Each part is important and necessary for their unique role in the world. And without it, something is simply missing, even downright wrong. Every letter and Everyone is Extraordinary! Unfortunately, we do not always recognize this until it’s gone.